wi da tug o aathin du nivvir lairnt. ta watch rushin up at de time an agien. Here’s a blast at isna past hit. Here’s a winter warmin up. Here’s da rod tae da empty forest. Here’s da fitprints washd bi da sea. Here’s a skin to begin to win on – taut/with the tug of everything you’ve ever learnt. //Here’s a frame to hang a future on – naked//to winds that blow no answers. //Here’s a cushion to fall, to fall/to watch rushing up at you time and again. //Here’s a blast that isn’t past it. /Here’s a winter warming up. //Here’s the road to the empty forest. /Here’s the footprints washed by the sea. 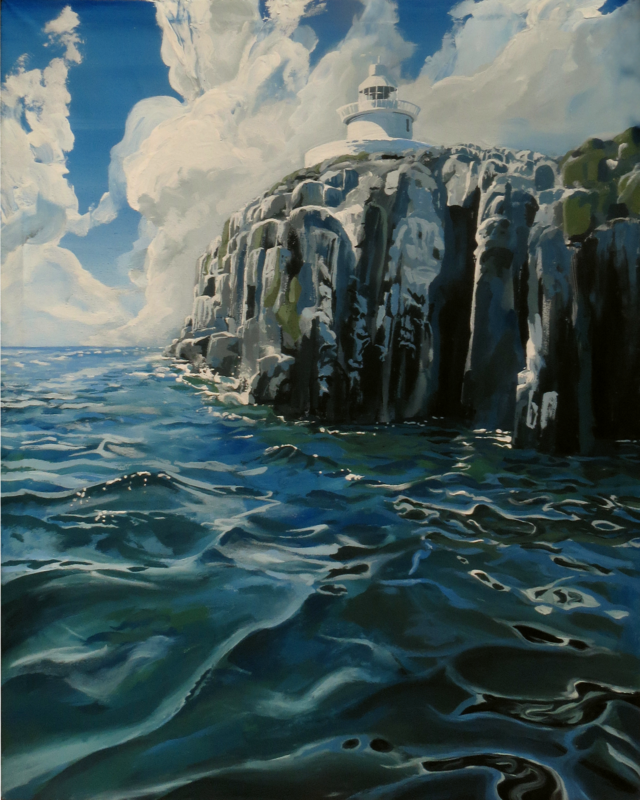 Image: “Inner Farne” by William Hamilton. Acrylic on canvas. 36 x 48 inches. Before 2018. By permission.